There is already a Snapdragon 845 naming successor on the market, the Snapdragon 850, and it is the proud chipset of Samsung's latest Galaxy Book 2 endeavor. That one, however, runs Windows, which should hint that Qualcomm is not aiming the 850 at phones and tablets with Android, and it is yet to detail the true 845 heir. In fact, there are rumors that it may switch the naming scheme for its mobile chipsets and title the next one Snapdragon 8150. 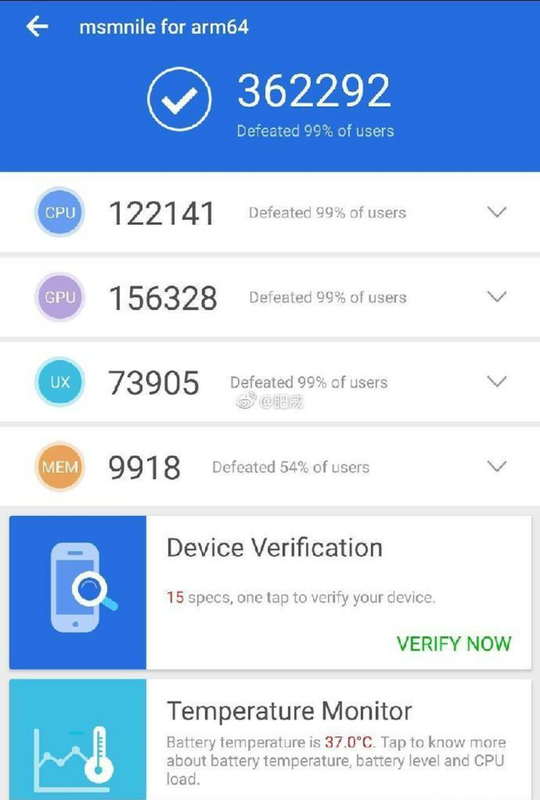 Lo and behold, a few test scores in the Geekbench and AnTuTu databases have appeared, precisely of the next-gen mobile chipset from Qualcomm, and AnTuTu claims it has checked its back-end database to confirm the silicon is indeed Snapdragon 8150. Right off the bat, the 8150 shot to Android prominence 362292 points on AnTuTu. For comparison, the highest score we've seen from the first 7nm chipset on Android, the Kirin 980, sits below. Not only that but currently the top score of Apple's A12 Bionic in AnTuTu's official iOS ranking is also a tad lower. When it comes to Geekbench, the А12 still rules but the alleged 8150 scores there are a huge leap over the best of Snapdragon 845 results. All in all, we can expect a large, medium and small kind of processor architecture in a "1+3+4" arrangement at 2.84GHz, 2.4GHz and 1.78GHz maximum clock speeds, respectively. AnTuTu adds that the next-gen Adreno 640 GPU performed about 20% better than the 630 that is in Snapdragon 845, so a nice boost in graphics can also be expected from Qualcomm's upcoming 7nm mobile chipset that will likely end up in the Galaxy S10 models stateside. But iOS is not for heavy multitaskers, why powerful A12 When you cant even open two apps at once? I have i7 6700k PC but I no more using it.. I can literally Do Anything with my N9 & 1+6t expect of course Gaming and heavy video encoding. I bought the new ipad pro 11”. I can do two apps at the same time effectively and reliably. Using two apps at the same time might be good for some apps, but not for all, especially apps that requires big screen. I can do two apps at the same time :-D Yeah, few apps I would add with my iPad Pro 12.9. iOS multitasking is nowhere near what I can do on Android or Windows. It true for now but wait till apple support split apps and other multitasking tasks in the next WWDC. Androids gonna cry out loud again. Why would Android cry about something it’s already had for years? Do you even think before you type your BS? No surprise of the gpu in this beast. Their cpus are really good at processing physics and always have been. Like the desktop PC market soon there will be no reasons to have latest CPU except for gaming and video encoding. Benchmark scores mean nothing these days. Yep, I saw a couple of speed test video where mate 20 pro is toe to toe with iphone xs max. Antutu is a poor metric. I thought the 8150 was due to come in a 2+2+4 set up, just like Samsung intends to use for the Exynos 9820. 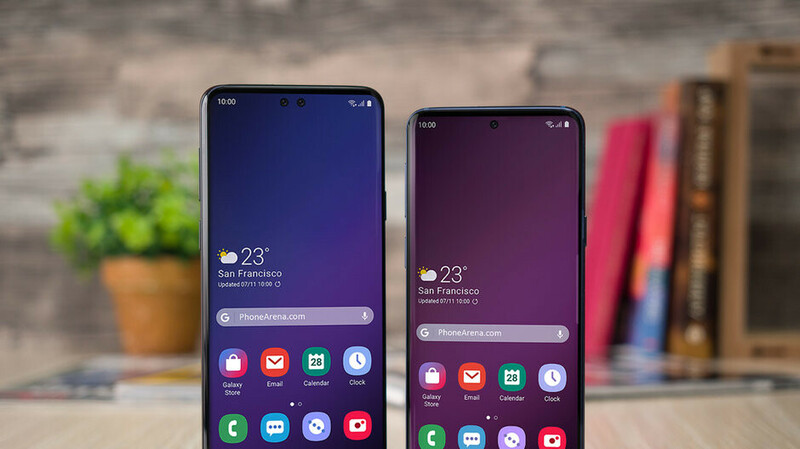 Pretty good scores though, more than good enough for 2019 flagships. 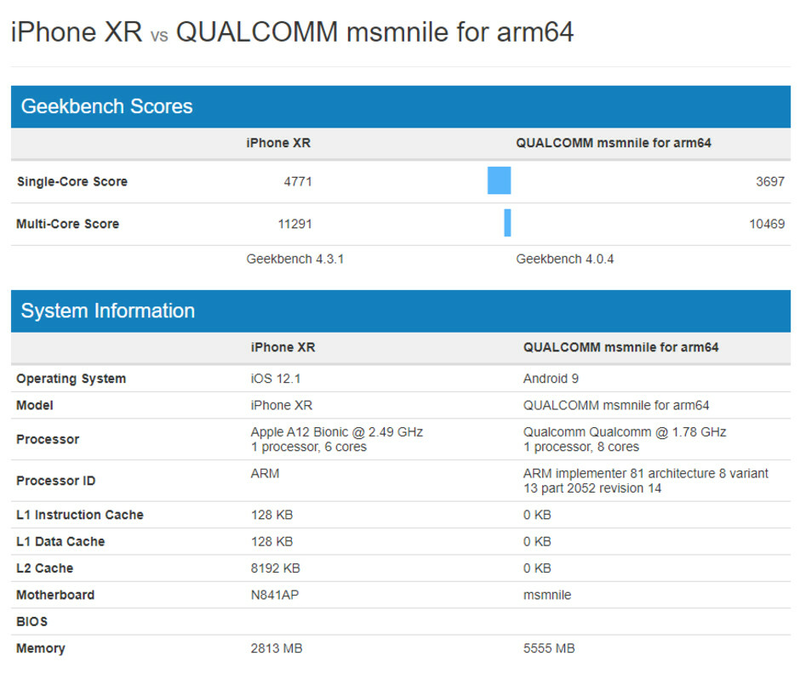 From the side by side at the bottom, it looks like if the Qualcomm chip was clocked at 2.5Ghz vs the 1.8Ghz it shows now, that the QC chip would actually score higher in the Geekbench score. So if you averaged out the total final score by the chip clock speed, if the QC was clocked equal to the A12, the QC would actually get a high score for multicore for sure. I mean look how close it is at a lower clock. And single core diesnt even matter because all.obile operating system are designed tonise multicore and so are the apps. So clocking a single Core is complete waste of time. Looks like QC has a winner. Sure both OS and applications can make use of multi core but it certainly not the same as saying single core don’t matter. That is completely wrong. The majority of applications you find on a mobile system still have a main thread. Look at test done by android authority, you will see a couple of threads doing pretty much all work (high load) while the rest is spread between the other cores. Using multi core is good for efficency but single core is very much important for high performance. On a server handling massive amount of parallell request, then multi core is more important but that is typically not how the workload looks on a mobile. Same story as every year. A-chips always lose to Snapdragons when it comes to Antutu. The A11 scored about 220000. While the 845 scored about 270000. Though this time the difference is not that big. Yeah keep talking android fanboys, i had S7 edge and the S8 and never ever had i used 2 apps at the same time one a phone.Thats just stupid, ok maybe on the iphone XS Max would that slightly work but that is definitely more useful on a tablet. And that whole notion that android is superior to ios is just BS, i bought my whole family ios devices and we couldn’t be happier with out decision. Try it you just might like it.